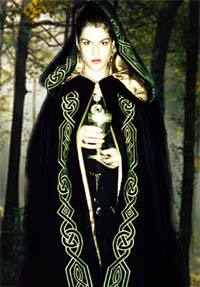 A stunning velvet cloak with Celtic knot work along the edges. Full kinsdale style hood and satin lining. 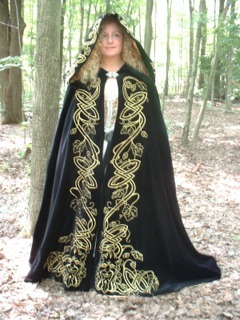 This cloak comes in a variety of colors with Silver, Copper, or Gold metallic thread. Meant for the Heroes of Elven lore, it was said this enchanting velvet cloak was meticulously embroidered with hand-spun gold or silver thread. An ancient leaf and vine work pattern was used along the edges and around the lare-pipe style hood. Legends states it was awarded to those that displayed all the Elven virtues during an act of great heroism. Later it became a symbol of betrothal, and it was widely know that any lady seen wearing one of these had won the heart of great hero. This cloak comes in a variety of colors with silver or gold metallic thread. The cut of the Celtic Cloak is in the Kinsdale style. if you would like the Celtic cloak with no embroidery, then the Kinsdale is for you. Dwarven Ruins have been embroidered along the edge of this cloak giving it the air of magic. "The Dwarves of Yor made Mighty spells" as the song goes, and this cloak is no exception. We are proud to offer you this small taste of middle earth, and may you wear it with all the pride of Thorain Oakenshield himself. The Cloak of Mordor has its origins on the ashen plains of Gorgorth. Although little know of it by the west, Mordor housed it's own Dark priests that did the earthly magical bidding of their Master Sauron. After the loss of the one ring, Sauron needed followers to envolk the dark things of the earth, for he was formless. This Cloak struck fear in any who saw it, for embroidered on its edge, in the ancient language of Mordor, is the Prophecy of the Ring. We now offer Matching Purses for all the embroidered Cloaks on this page. As with all those other fine cloaks, these purses come in same variety of colors with Silver, Copper, or Gold metallic thread. This Cloak will available soon.